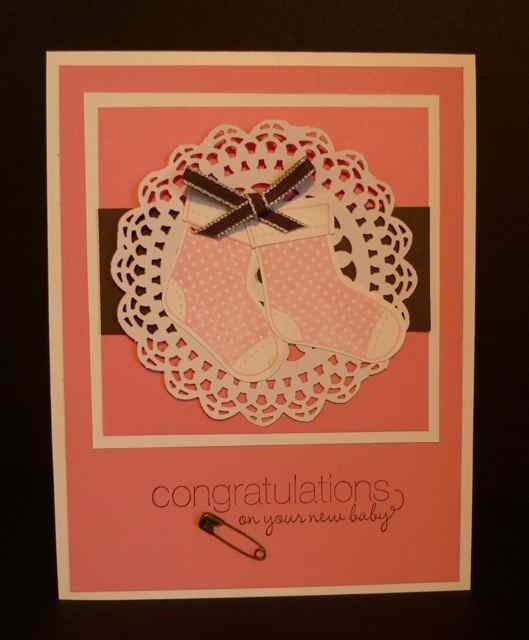 Karina's Kreations: Baby Girl Card! I made a cute little card today for my friend Kim. She had a baby girl. I hope she doesn't read my blog because it's for her shower but it was so cute I wanted to share it with you. I used the Stitched Stocking stamp set to create baby booties. I love this stamp set!!!!!! 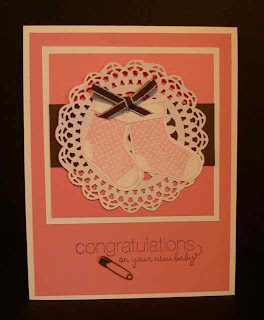 The doily is from the Flirtatious Specialty Designer Series Paper Pack. The card stock colors are Whisper White, Regal Rose & Early Espresso. The greeting is from the Friendly Phrases stamp set. Notice the safety pin? It's part of the Vintage Trinkets embellishments pack.